One of things I love to do is create my own recipes. I love lemon meringue pie but with a load of apples in the garden, I tried something new and it works and I'm really happy to share. It was very good and very easy. Every apple is different so if you need to play around with the cornflower/starch in the recipe please do so and it needs be thick so it will set. Apples and spice are beautiful together and I've put these over a ginger biscuit base. Oh and I've cheated and ginger nuts are shop bought. Smash up the biscuits in a freezer bag with a rolling pin. if it's been a bad day you will feel better after this! For the filling, heat the stewed apple and combine the water and cornflower to make a paste. When the apple juices have reach bubbling temperature / boiled up, then add the cornflower and stir like crazy until it make a thick paste. Spoon over the ginger nut base. Don't worry if you are new to this, if it goes lump, pop it through a sieve. Whip the egg white until they form soft peeks, add the sugar and spoon on top of the apple spice mixture. A sprinkle of cinnamon looks good on the top. Bake for 20 minutes at 180C or similar. I want to share with you a #vintagepledge shift dress I made for my birthday party two weeks ago. The dress was a last minute make as I picked up the fabric the week before my birthday and thought I should make a new party dress as the fabric was so gorgeous! 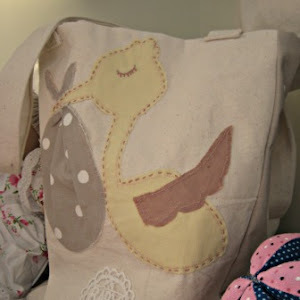 The fabric was from My Fabric Place who have a great selection of fabrics online and in their Nottingham shop. I popped in as the shop is now opposite the new tram stop and within ten minutes I walked out with a bag of fabric for £6. My dress which is made of a double layer of crepe with a gold knitted top layer actually cost me £3. 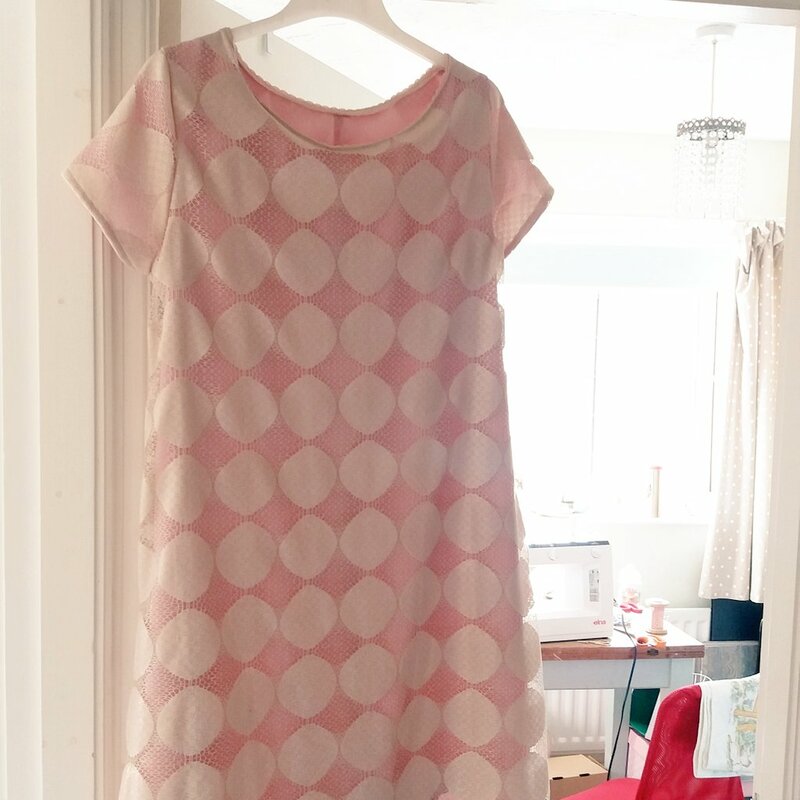 I cannot honestly believe it that in 2016 I can make a dress for £3! True vintage prices! 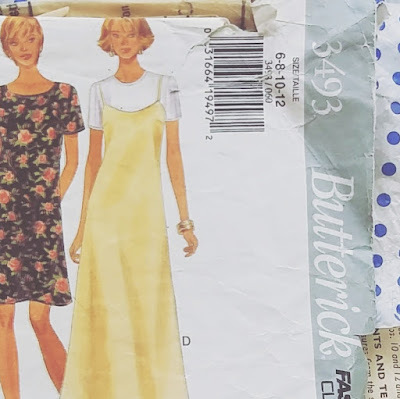 The pattern is a very faithful Butterick 3493 which is sadly out of print buy available on Etsy and Ebay. Both the shift (no bust darts and no zip) plus the strappy dress (with bust darts and zip) have been sewn time and time again by me since the 90s! I cut the dress out first with a layer of pink crepe but it needed two to make it less sheer and more floatly. I stitched up both layers of crepe first and then the knitted layer as a separate garment and securing at the back seam and shoulders. Once I'd made it, I shared this photo over on Instagram . Here are a few photos of my party dress with a 60s/90s vibe. I finished the dress just above the knee with the crepe as one hem (hand hemmed) and the knitted hem as a machined hem to get a tidy non-frayed finished. Today has been a very sunny, beautiful August day. The perfect day for my little lady to wear her new Simplicity dress I stitched up for her in this strawberry printed fabric. Now four, she loves that 'Mummy made me a dress', and has been my creative director through the project. 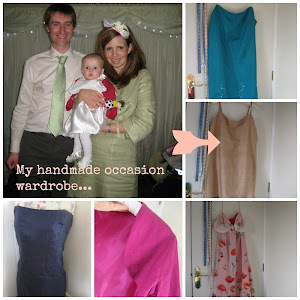 In this post I'm talking about how myself and Little L (my daughter) made this oh so pretty dress. 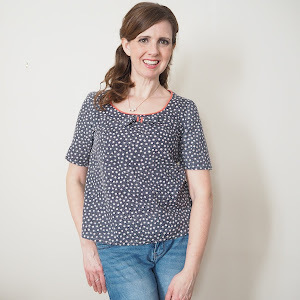 Back in July I was sent this pattern to make as part of the Simplicity Blogging Challenge. 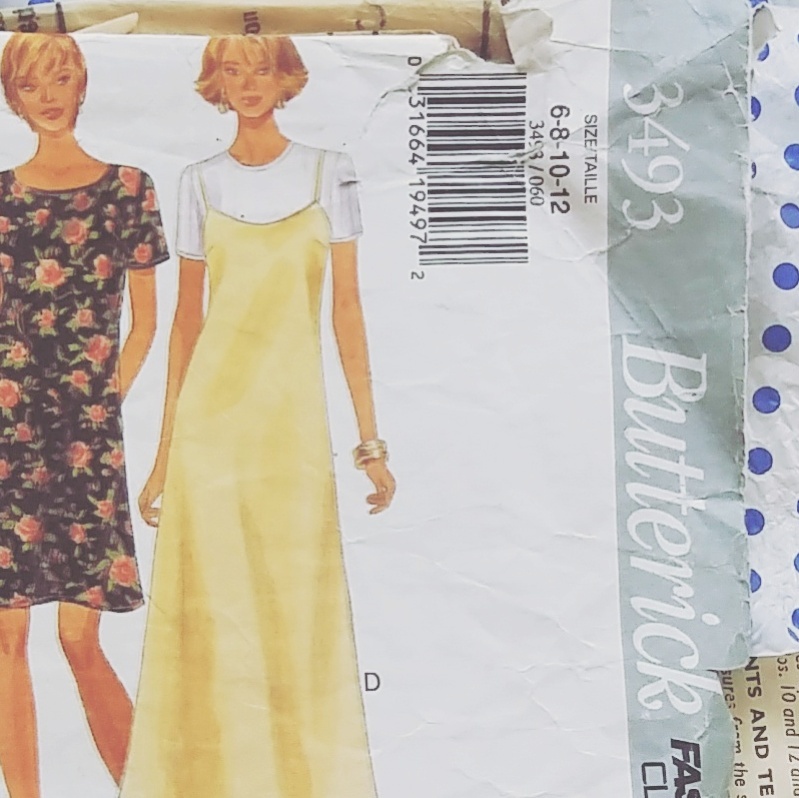 I entered under Children's Wear as I loved the little girl's dress on the right and had a stash of cotton fabrics awaiting the perfect pattern. 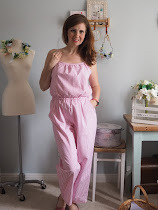 I've been sewing Simplicity patterns since I was a teenager (about 20 years) and love the easy to follow patterns and they go together like a dream. Sewing for a slim four year old isn't easy, so I thought that the swing dress would be easier to fit and sit well on the yoke and on her shoulders. We decided on view A, the sleeveless version so we could put a t-shirt under it on cooler days and decided to cut the skirt frill half the size so the dress wasn't too long. I wanted to make it smaller under the arms than the pattern but she liked it's swing coolness which was great for today. I made the bow but Little L didn't want to add it to the design. We may make it into a hair slide for the dresses next outing! I also added poppers down the back and created a false placket out of bias instead of a back zip fastening. The zip isn't too comfortable again her spine in a car seat. I try to avoid zips on the back of dresses for her. The dress fitted really well on her shoulders with the yoke. It was really straight forward to stitch and no unpicking! I was worried about pulling the threads on the print if I had to. I hand finished the dress with a slip stitched hem. I love the finish you get from a good hem. The instructions for the yoke were really clear, I've added a photo below. I liked the idea of biasing around the arm hole instead of faffing with a facing. It gave a really clean finish. We loved the neckline as it's really delicate with a neat arm seam finish. Thank-you to Simplicity, I really love the pattern and we will be making it again. The pattern for this project was gifted but all views are my own. After a super hot July week, I'm popping by to share my tutorial on how to sew a wooden handled bag. Perfect for lazy days out this Summer. The tutorial featured on Made By Mrs M's blog last week. You can read more here . Thank-you Kate for inviting me to share my love of vintage inspired accessories! I love all the beautiful fabric's Kate has created using mid-century as a design source and including iconic modern London buildings. As an ex-Londoner, I love her prints, they remind me of the fabulous architecture London as to offer. 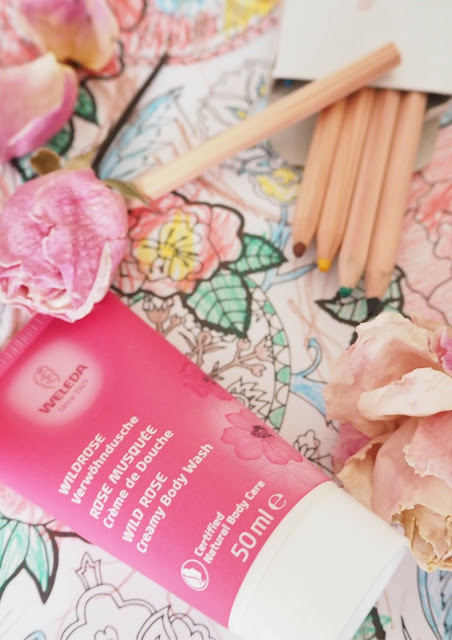 Read more about how Kate and her passion for creating fabric. I've said to Kate, once I get my mid-century house, I'm going to fill it with her prints! Kate - hold me to that! Thanks again.